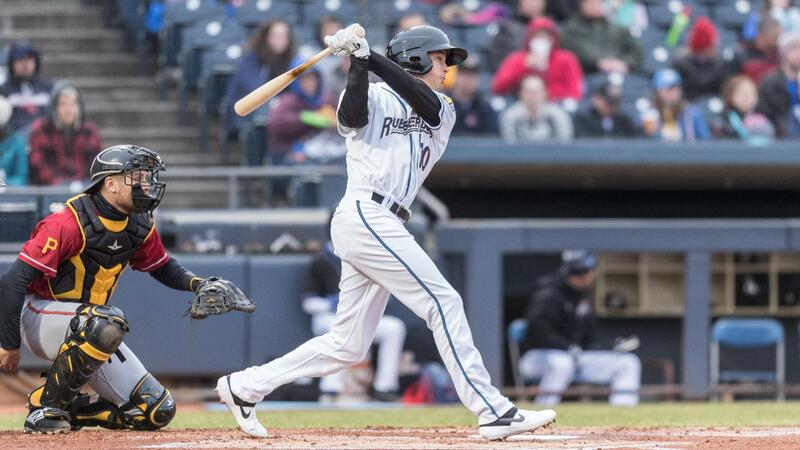 Altoona Curve right fielder Bligh Madris hit a walk-off single with one out in the bottom of the 12th inning to defeat the Akron RubberDucks, 3-2, at Peoples Natural Gas Field in Altoona Thursday night. The RubberDucks broke a 1-1 tie in the top of the 11th inning on third baseman Andruw Monasterio 's sacrifice fly, scoring Wilson Garcia . In the bottom of the 11th, Altoona tied the game against left-hander Rob Kaminsky when pinch hitter Robbie Glendinning's two-out ground ball got past second baseman Tyler Krieger . Glendinning tried to score later on a wild pitch, but catcher Li-Jen Chu threw to Kaminsky for the inning-ending putout. RubberDucks starter Matt Solter pitched four scoreless innings in his Double-A and Indians organizational debut. Left-hander Brennan Bernardino began the fifth inning with a scoreless tie and yielded a sixth-inning RBI double to Hunter Owen but completed three innings in his Indians organizational debut. Left-hander Ben Krauth struck out four batters in two scoreless innings, and right-hander James Karinchak struck out three batters with the winning run at third base in the 10th inning. Kaminsky pitched 1 1/3 innings and was charged the tying and winning unearned runs. Altoona left-hander Cam Vieaux held Akron to one hit in six shutout innings. Right-hander Tate Scioneaux (1-0) was the last of four Curve relievers and pitched a scoreless 12th inning. Krieger had two of Akron's four hits, including a leadoff double in the seventh inning. He later scored on a balk by Altoona right-hander Vicente Campos that made it 1-1. Mitch Longo and Li-Jen Chu had the other RubberDucks hits. Thursday was the first extra-inning game of the season for both the RubberDucks and the Curve…Altoona has won each of the clubs' first five meetings, including all four on Opening Weekend at Canal Park…A stretch of 11 consecutive scoreless innings by the Akron bullpen ended with Altoona's sixth-inning run…Five-game hitting streaks by Garcia and Monasterio were each halted…Time of game: 3:26 (Akron's season long)… Attendance: 5,023. The RubberDucks continue the series in Altoona on Friday night at 6:00 p.m. EDT. RHP Zach Plesac will start for Akron, and RHP Scooter Hightower will start for the Curve. The game will be broadcast on Fox Sports 1350 AM, the WARF iHeart channel, and the TuneIn Radio App.